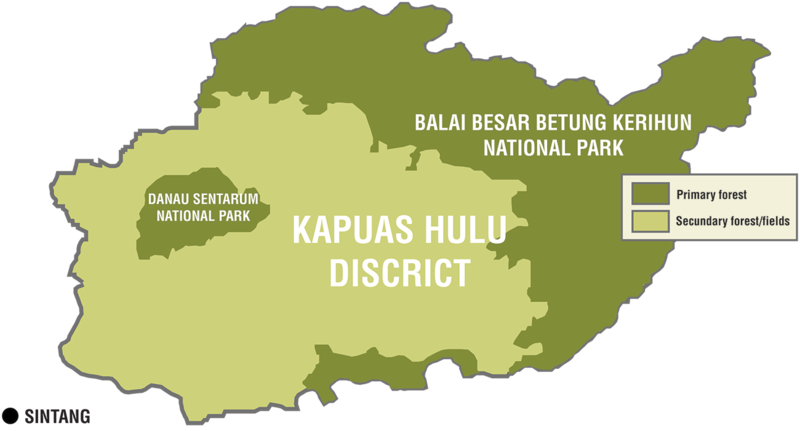 Kapuas Hulu district is the uppermost part of the province of West Kalimantan. The northern part of the district belongs to the “Heart of Borneo” designated national park area. It’s called the Betung Kerihun park (Named after the Kerihun peak the highest peak in this area). The park straddles the border of the province of Sarawak (Malaysia). Betung Kerihun National Park represents some of the oldest rainforest in the world and last remaining natural habitats of Kalimantan. The ecosystem diversity in the park is very high and the forest vegetation is still good and relatively intact. Based on field observations, forest areas in Betung Kerihun National Park can be classified into eight ecosystem types, namely Lowland Dipterocarp Forest, Alluvial Forest, Swamp Forest, Old Secondary Forest, Hill Dipterocarp Forest, Limestone Forest, Sub-Montane Forest, and Montane Forest. Indigenous people in this part of Kalimantan are mostly Iban Dayaks which are consisted of a few sub-groups, and ethnic Malay subgroups. The Dayak still lived in basic settings like longhouses with high stilts next to the riverbank. The Iban Dayak have forever owned the old rainforest of Betung Kerihun and are still fiercely protecting the area from loggers and other people who want to use and destroy the forest for their own gains. One of my suppliers is based in the town of Sintang, very close to the Kapuas Hulu district and he has quite a large concession in the Betung area where he and his crew (consisting of only Iban tribesmen and women) harvest their kratom in a sustainable way, meaning they will never damage the trees nor kill them, also no pesticides are used on the old forest kratom trees to increase production. Old trees also don’t need pesticides since they are strong enough to withstand harmfull insects and other pests that damage the leaves on their own. In July (Godwilling) i will be back in Borneo and will try to visit the Kapuas Hulu region again. Sadly last time i could not reach the area because of draught. The river so low that boats could not reach the area and since there are no roads the river is the only way to go there. Hopefully in July it will be better and i will be able to reach the area and make a documentary (a long dream of mine) of the kratom picking/harvesting, drying in this area.